JONES, ROBERT, draftsman, builder, merchant, office holder, farmer, and militia officer; b. 26 April 1778 in Hawkhead, near Paisley, Scotland, son of William Jones and Margaret Locke; m. 2 Aug. 1803 Hannah Simpson of West Kilbride (Strathclyde), Scotland, and they had eight children; d. 25 Nov. 1859 in Pownal, P.E.I. Jones, who was a freemason while he lived in Charlottetown, seems to have been a respected and practical man. He was appointed surveyor of timber for Prince Edward Island in 1813 and travelled frequently to the Pinette–Belfast area where he appears to have been an agent for Waters and Birnie. Two years later he and a business associate, Robert Patton, leased a mill on the Pinette River owned by Lord Selkirk [Douglas*]. Even though a total of 90 man-days were spent repairing the mill, William Johnston*, Selkirk’s agent, informed the owner in 1815 that Jones and Patton were “behind the rent, altho’ Jones is an industrious laborious man,” and mentioned the “repeated breaking down of the dam which had been faulty in its original construction.” Small wonder Jones gave up the lease the following year and moved to Pownal where he cleared some land, built a house, and began farming. He then became involved in a number of public-spirited activities, first as a captain in the militia from 1820 to 1827, and then as surveyor of timber for townships 49 and 50 in 1821. 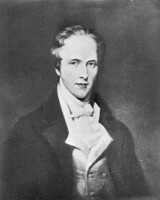 Two years later he joined Paul Mabey*, Donald McDonald, John Stewart*, and others in petitioning High Sheriff John MacGregor to convene meetings that would enable Islanders to air their grievances against Lieutenant Governor Charles Douglass Smith, acting receiver general John Edward Carmichael*, and Ambrose Lane. 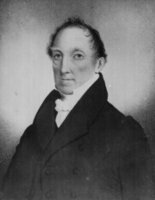 In 1825 Jones was commissioner of highways for townships 48, 49, 50, and 55, and in 1826, 1829, and 1830 he served as fence viewer and constable. He was appointed a census taker in 1827; the only fragments of this census known to exist are from some of the lots he canvassed. That year he was also among those who joined Lieutenant Governor John Ready* in forming the Central Agricultural Society, one of whose goals was to obtain and distribute better seed grain and potatoes to all who were interested. Despite the numerous public offices Jones held, he made his most lasting mark as a draftsman and builder. Although his plans for the new court-house in Charlottetown were rejected shortly after his arrival in favour of the design by John Plaw*, he constructed a number of buildings in the capital. His masterpiece, however, completed in the mid 1820s for John MacLennan, was St John’s Presbyterian Church in Belfast, whose proportions and simple lines have been described as an architectural gem of “carpenter gothic.” Its “crowning feature,” the tower, was inspired by Sir Christopher Wren, whose churches Jones had seen in London. A public duty connected with his career as a builder was discharged in 1834–35 when he was appointed to inspect and report on the workmanship and the materials used in building Charlottetown’s Government House and Central Academy. A devout Baptist and staunch abstainer, Jones frequently conducted Sunday church services and was instrumental in forming a community church before Baptist churches were built in the Pownal area. In addition to continuing his trade by designing and building houses, furniture, sleighs, and wagons, he was often called upon to render advice and assistance to members of the community. When he was almost 70 years old he planned, and then helped his son build, the house that is still the Jones homestead in Pownal. His great-grandson, John Walter Jones*, was to become premier of the Island. The Robert Jones papers are in the possession of Mrs Wilbur Jones and Arthur Jones (Pownal, P.E.I.) (copy at P.E.I. Museum and Heritage Foundation (Charlottetown)). PAPEI, RG 8, Warrant books, 1827–28, no.522; 1834–35, no.951; 1835–36, no.1064. P.E.I. Museum and Heritage Foundation, Charles Jones coll. Islander, 9 Dec. 1859. Prince Edward Island Register, 13 Sept. 1823; 23 April, 13 May 1825; 28 March 1826; 19 June 1827; 24 March 1829; 15 June 1830. Weekly Recorder of Prince Edward Island (Charlottetown), 27 June 1811. W. B. Hamilton, Local history in Atlantic Canada (Toronto, 1974), 171. M. A. Macqueen, Hebridean pioneers (Winnipeg, 1957), 42–43, 48–49, 78. M. R. Ross, “Pioneer builder of St. John’s Church,” Historic sidelights, Prince Edward Island ([Charlottetown, 1956]), 69–71. F. H. Sinnott, History of the Baptists of Prince Edward Island (n.p., n.d.). Orlo Louise Jones, “JONES, ROBERT,” in Dictionary of Canadian Biography, vol. 8, University of Toronto/Université Laval, 2003–, accessed April 22, 2019, http://www.biographi.ca/en/bio/jones_robert_8E.html.